One of my favourite foods in the world is ramen, and if you haven’t tried it yet, you’ve got to! How could anyone not love this dish! Its basic composition is pork bone broth, noodles and meat. It may sound simple but creating the perfect noodle bowl is a skill that one must master to deliver the umami sensation that diners flock to. This past January I met the owner’s of Asian Alley, located in Ottawa’s ByWard Market. 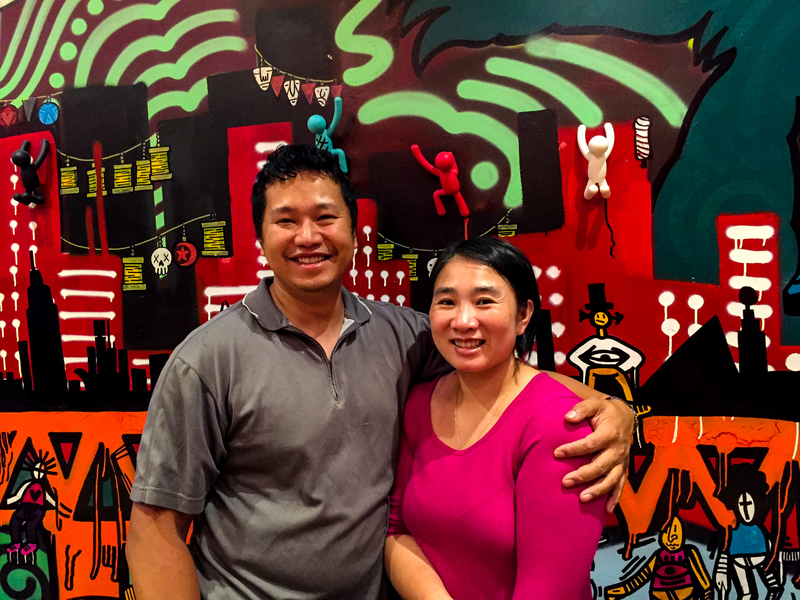 Hoang and Lisa are some of the most passionate restaurateurs I have ever met. They not only love food, but they work day and night developing flavours that will kick your tastebuds into high gear. Having sought and tasted some of the best noodle bowls around North America, I have had ramen in New York, Toronto, and Montréal, to name a few. I told Hoang, let’s share your story and the development of your ramen, and throughout the process, I will come in, sample and provide feedback. I visited Hoang and Lisa at Asian Alley last week. If you haven’t had the chance to dine there yet — you must! Its flare with painted walls and glazed floors, laced with pennies, make your experience one of a kind. We started in the kitchen where two broths were simmering. The aroma was simply outstanding! The braised pork belly just waiting to be sliced, Lisa started sautéing the black fungus. I’m not going to lie — I was getting very excited about what I was seeing. We sat down in the dining room as the restaurant had just closed for the night. Silky smooth on the tongue, rich, creamy yet not heavy, with the richness fading away, leaving no lingering fat on the tongue. A cool sensation, one I have never had as that coating normally stays. The warmth of the sake shined through because it is added near the end which created a wonderful mouth sensation. The common vibrance of the broth was not the typical creamy, yellowish tint of a bowl of tonkotsu. Proportions of toppings were a little off and the garlic in the black fungus was sliced too big. Pork belly was flavourful and had a nice texture, not tough and not too soft. Silky smooth, somewhat sweet, rich, creamy, a little lighter than the first broth, not much coating of the tongue. Proportions of toppings were correct and less garlic presence. As I told Hoang & Lisa, what an amazing couple of attempts! Both bowls were almost perfect, but bowl #1 was my preference. Be sure to visit Asian Alley and taste their amazing menu and specials! Visit Asian Alley on Facebook, Twitter and Instagram!